What better way to celebrate Valentine’s Day than with the decadent combination of Strawberries and Chocolate? 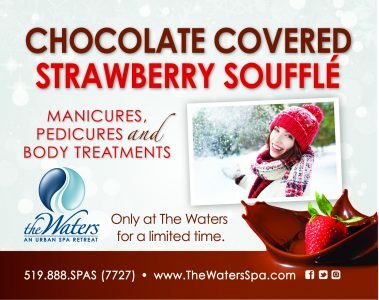 This season, we are serving up manicures, pedicures, and body treatments with the scent of Chocolate Covered Strawberries. Umm….yes please! From now until the end of March, you can enjoy your Manicure or Pedicure with these new, home-made products. Or, try a full body treatment to deeply cleanse and soften your skin. Just because your skin is hiding under sweaters and parkas doesn’t mean it can’t be soft and supple. You can even choose our yummy Strawberries and Chocolate oil for your next massage. Sweeten the deal by inviting a loved one to share some togetherness at The Waters. Wowzas!